Boy, did we eat in Thailand! We lived largely off veg noodle soup, pad thai or by the coast tom yum soup with prawns. Thai slalds will definitely be made back home: papaya, mango, glass noodle salads all that magic combination of salt, sweet, sour and spice. As we moved south we ate more bao (steamed buns) with green or black bean fillings, and doughnuts dipped in sweetened condensed milk. Sweet treats are everywhere, often made from gelatinos rice in sometimes luminous colours and indistinct flavours, such as the purple jelly cylinder filled with a peppery, salty, sweet dough in the centre!! We soon became addicted to anything containing coconut and roadside iced coffee. As we moved south the tropical fruit selection grew from baby bananas, pinnapples and mangoes to mangosteen, jack fruit, longkons (like lychee but better), rambutans an the infamous durians whose smell we did not think to be so unpleasant as others say but definitely has a whiff of rotting mangos. A feast for the eyes of brilliant bright colours and healthy sweet treats! Thailand’s biodiversity is incredible with its rich jungle landscapes, mountains and huge coastline. We saw a few too many snakes for our liking, often the huge ones with guts strewn across the road. We saw plenty of colourful kingfishers, huge water monitor lizards (second biggest lizard after the komodo dragon), super cute but shy dusky langur monkeys, cheeky roadside gibbons, silly looking cows with floppy ears, huge bulls wearing necklaces and flip-flops (no joke), and even spotted a few sea eagles near Chumpon. 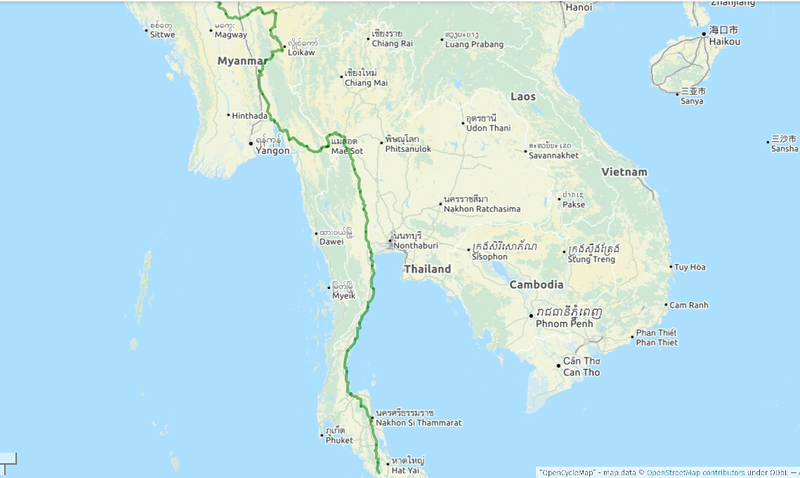 We cycled through a vast array of agricultural land, mainly tapioca and sugar planations in the north and coconut, palm oil and rubber plantations in the south. 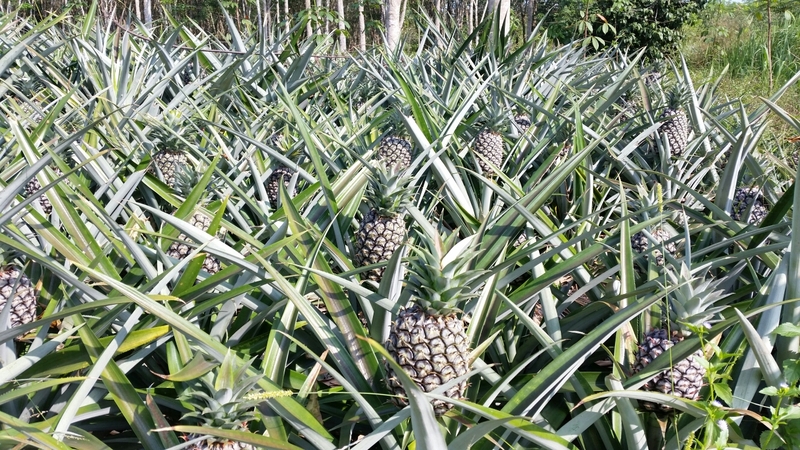 Pinnapple plantations never ceased to fascinate us!